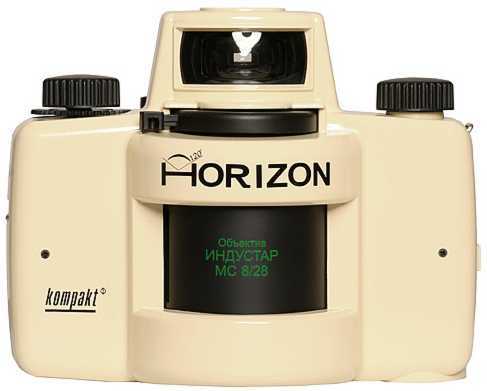 Horizon Kompakt is a compact lens camera with a rotating non-interchangable built-in lens intended for taking various panorama pictures: landscapes, interiors, sports scenes, architecture, reportings, fashion, tourism, etc., both by the amateur and professional photographers. This cream-colored knockout is designed for one sole purpose: dead-easy and endless panoramic snapshots! A fast setting for day and slow setting for night afford you 24-hour and indoor/outdoor access to the overwhelming joy of panoramic pleasure.